The Business Game—here’s how you can win! Never-ending to-do lists and sacrificing your quality of life to succeed? If you answered "yes" to any of these, you’ve been playing The Business Game and suffering the consequences. Even if you’re rolling in profits right now, there are hidden costs you’re paying to earn that money—money that’s always at risk. You learned "the rules" and you’ve been faithful to them, thinking you can win. But you can’t really win The Business Game, because it’s designed to be unwinnable—that is, as long as you play by the rules you were taught. The only way to truly win is to bust loose from the "old" game and start playing a new game with a new set of rules. Watching as amazing results come your way, without having to "make it happen"
It may sound unbelievable, but it’s entirely possible. You can do it—if you open your mind and embrace the strategies in this book. 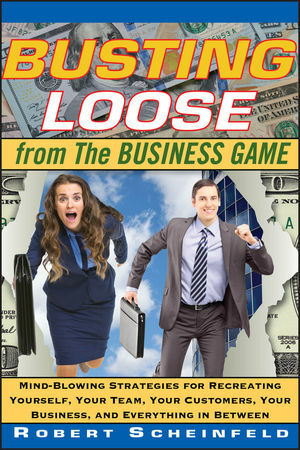 Busting Loose from The Business Game leads you into a New Business Game filled with results and satisfaction beyond anything you’ve ever imagined possible. Read on… and bust loose! ROBERT SCHEINFELD is the New York Times bestselling author of the Wiley titles Busting Loose from The Money Game and The 11th Element, as well as The Invisible Path to Success. For more than twenty years, he has helped people in more than 190 countries create extraordinary results in less time, with less effort, and with much more fun. His passion is helping others bust loose from their limitations so they can create and enjoy their ideal lifestyle. CHAPTER 1 The Big Lie. CHAPTER 2 The Big Truth. CHAPTER 3 The Fantasy Factory. CHAPTER 5 The Physics of Fiction. CHAPTER 6 The Two Ps. CHAPTER 7 The Many Faces of Power. CHAPTER 8 The Myth of Cause and Effect. CHAPTER 9 Redefining the Nature of Business. CHAPTER 10 The Sun and Clouds Effect. CHAPTER 11 Assembling the Drill—Part 1. CHAPTER 12 Assembling the Drill—Part 2. CHAPTER 13 Stranger in a Strange Land. CHAPTER 14 When the Going Gets Tough. CHAPTER 15 Recreating Yourself, Your Team, Your Customers, Your Business, and Everything In Between. CHAPTER 16 Red Pill or Blue Pill?